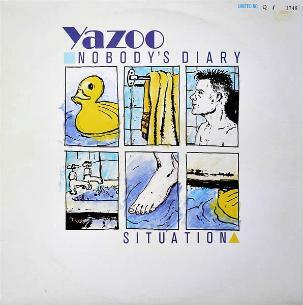 The video clip features Yazoo performing on Top Of The Pops (UK), after being introduced by Radio One DJ Gary Davies as a new entry at #20. It's a very clear clip, although I'm afraid the audio is out of sync. As with another favourite electronica band of mine, Kraftwerk, I like the minimalist approach to the song which almost always works well with synthpop tunes. Keeping your arrangements uncluttered makes a track so much easier on the ear, and also makes the song easier to record in the studio - less is more! A good many of today's pop artists have tried to emulate the early 80s electronica sound, but the original tunes are still the only ones that really work for me. Nobody's Diary was the only track to be released as a single from the synthpop band's second album You And Me Both. The song was Yazoo's fourth British single release overall and reached #3, and it also reached #1 on the U.S. Hot Dance Club Play charts. Written by Alison Moyet, the B-side on the standard 7" and 12" was State Farm. However, a special limited edition 12 inch featured a re-recorded remix of Situation, which was originally the B-side to Only You, although it had already been released as an A-side in the U.S., but only reaching #73 in the Billboard Hot 100.